Is it worth getting a flu shot this winter? Dr Sibongile Walaza, a medical epidemiologist at South Africa’s National Institute for Communicable Diseases and lecturer at Wits, explains more about it. Influenza, more commonly known as flu, kills between 6000 and 11 000 South Africans every year. About half of those deaths are in the elderly and about 30% in HIV-infected people. During the flu season in South Africa about 14% of patients hospitalised for pneumonia and 25% of patients with flu-like illnesses test positive for flu. The flu vaccine – which prevents one from getting flu – should ideally be taken between March and June, before the flu season starts. But getting it later will protect you during the rest of the season. What is the flu and how is it different from a cold? Influenza or flu is a virus spread from person to person. It can cause many different symptoms, but it commonly causes fever, cough, sore throat and body aches. It can also cause headache, fatigue, muscle pain, shivers, vomiting and diarrhoea. Influenza is caused by one of several respiratory viruses. There are other respiratory viruses that circulate during the flu season that may cause similar symptoms but are not the flu. Many of these other viruses cause a common cold, which can be differentiated from the flu by the fact that the person has upper respiratory symptoms (a runny nose/congestion) that are not usually accompanied by the generalised body aches and overall sick feeling that comes with the flu. In South Africa, flu circulates during the winter months. The average season starts in the first week of June, but it can start as early as April or as late as July. The season typically lasts about 12 weeks, but it can be as short as seven weeks or as long as 25 weeks. People with the flu maybe able to pass it on to someone else before they know that they are sick or while they are sick. A person with the flu is contagious one day before symptoms appear and for three to seven days after the onset of symptoms. Some people, especially young children and people with weakened immune systems, maybe able to infect others for even longer. Flu symptoms can take from one to four days to present after a person is exposed to a flu virus. Is the flu in South Africa different from that in other parts of the world? Why? We cannot predict whether the same influenza strains as those in other countries will be circulating in the coming influenza season in South Africa. The influenza virus is constantly changing; it is possible that different strains of flu virus circulate each year. The strains in the southern hemisphere may vary from those that circulated in the northern hemisphere and sometimes there is an overlap. Towards the end of the influenza season, it is possible to compare whether the influenza strains that circulated in South Africa that season are similar to what was circulating in other countries or to strains that circulated during the previous northern hemisphere influenza season. What is new with this year’s flu and the flu vaccine? Each year the World Health Organisation gathers data on flu strains from different countries. The organisation analyses data at the end of the southern hemisphere winter, in September, and at the end of northern hemisphere winter, in February. Based on this analysis a recommendation is made of which influenza strains to include in the formulation of the southern and northern hemisphere vaccines. As a result, information from the strains that circulated the previous influenza season informs the vaccine selection for the following year. For the southern hemisphere, the flu vaccine for 2016 has changed. It was updated with two new viruses to try to match with what is expected to be circulating this season. South Africa uses a vaccine that contains three types of viruses. Some countries use a combination with four types. Who should get the vaccine and who shouldn’t? Pregnant women, people with chronic illnesses like diabetes, lung disease and heart disease, HIV-infected people and those who suffer from tuberculosis are at increased risk of hospitalisation and death from flu infections and should get the flu vaccine. People older than 65, children between six months and four years, and children over six months who are on long-term aspirin therapy should also get the vaccine. In addition, health-care workers, residents of old-age homes, chronic care and rehabilitation institutions, adults and children in close contact with individuals at risk of severe flu, and anyone wishing to reduce the risk of getting flu or spreading it to others should consider getting the vaccine. Anyone who has had a severe reaction to the flu vaccine should not get it. Severe reactions include difficulty breathing, a drop in blood pressure, a loss of sensation in the feet or any condition that required hospitalisation. How effective is the vaccine and is it only valid for a year? The vaccine is 60% effective in healthy adults. Elderly people, children under the age of two and people with weakened immune systems may not respond as well to the vaccine – but they may still get some protection from it. 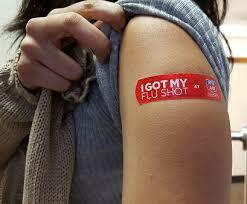 A flu vaccine contains different types of inactivated – or dead – flu viruses. The viruses have been changed (killed) and cannot make you sick. But the flu vaccine does not prevent other viruses from causing colds during the winter season, it only prevents influenza viruses. It takes 14 days after vaccination for your immune system to build antibodies to provide protection. The strains of flu virus may change from year to year and a flu vaccine is therefore needed every year. The vaccine may also change to protect against the most recent flu virus strains. Even if the flu strains do not change, yearly vaccination is still recommended as protection from flu through vaccination is not long lasting. * This article is published with permission from The Conversation Africa.